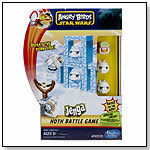 TDmonthly® - New Toys and Games: Angry Birds Star Wars Jenga - Hoth Battle Game from HASBRO INC.
It’s time for a hilarious Angry Birds squawk attack against the pigs of the Empire. Gear up to bombard Imperial hogs in the frozen terrain of Hoth with this awesome Jenga Hoth Battle Game. Take turns being the builder and the launcher. One player will set up the ice blocks while the other uses the Snowspeeder launcher to hurl the Luke Skywalker bird at the Snowtrooper pigs on the blocks. 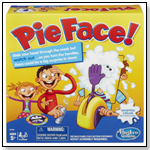 Or, kids can play by themselves and see if they can knock all the pigs off with the fewest number of shots. Can be combined with the Jenga Death Star Battle Game (sold separately) for even more epic battles.